Norwalk, CT - Wednesday night, the Junior League of Stamford Norwalk (JLSN) and the Open Door Shelter unveiled Open Door Shelter’s revitalized Family Resource Center — a cheerful after school room that will serve the approximately 20 children who are living with their families in the shelter at any given time. Beginning in August, JLSN volunteers remodeled the existing Family Resource Center to create new workstations, a reading nook, and a lending library. 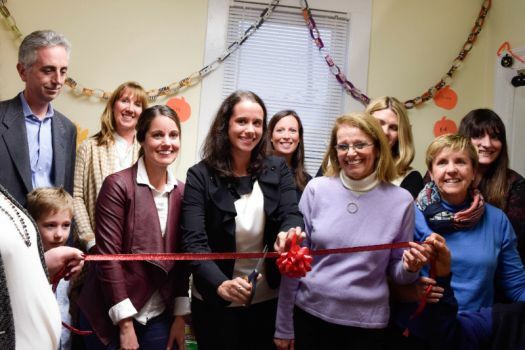 Following the ribbon cutting ceremony, families enjoyed a healthy meal provided by Palmwich of Darien and Junior League volunteers spent time reading and doing a craft project with children in the shelter — the first of three literacy nights that JLSN will host at Open Door Shelter this year.